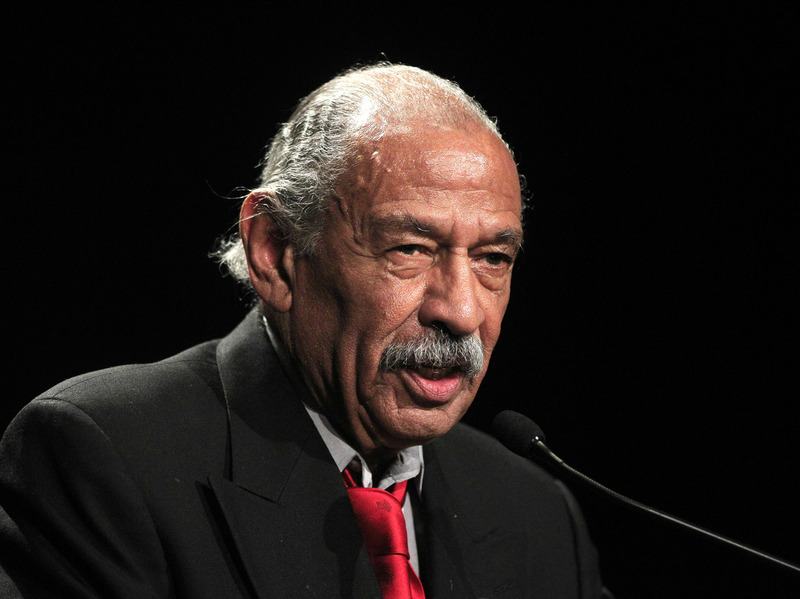 Detroit Federal Judge OKs Rep. John Conyers For Primary : The Two-Way The court overturned a decision by Michigan's secretary of state declaring the congressman ineligible because of problems with his nominating petitions. Rep. John Conyers, D-Mich., addresses supporters during the Michigan Democratic election night party in Detroit. Conyers has served in Congress since 1964, but problems with ballot petitions have threatened to keep him out of the August primary. This post was updated at 4:40 p.m. ET. A federal judge in Detroit has ruled that Democratic Rep. John Conyers, the second-most-senior member of the U.S. House, will appear on the August primary ballot, overturning a decision by Michigan's secretary of state who said the candidacy was invalid. Judge Matthew Leitman issued an injunction ordering Conyers' name to be placed on the ballot, The Associated Press says. Earlier Friday, Michigan's Secretary of State's office affirmed a decision by Detroit-area election officials that petition signatures gathered by at least five circulators were invalid "because they were either not registered to vote, not registered to vote while the petitions were being circulated or had addresses on the petitions that didn't match their voter registrations," The Detroit Free Press says. "As a result, the SOS ruled Conyers had only 455 valid signatures, far short of the 1,000 required by state law," the newspaper says. Secretary of State Ruth Johnson said the lack of valid signatures "renders [Conyers] ineligible." "Conyers, 85, appealed to Johnson that bureaucratic bungling by the Detroit clerk and Secretary of State's offices led to the voter registration problems of his petition circulators. Restoring hundreds of improperly disqualified signatures would have given Conyers more than the 1,000 signatures needed under state law."